“Sauce” was the only criteria in my father’s choice of a birthday meal. “What would you like to have as a birthday meal Dad?”, “Well I like something with a bit of sauce”. Make that drowning in sauce, and it’s true if it doesn’t have sauce he’ll add some. Maybe of the thick red kind. And as my dad likes his sauce and curry, rather than go to the Indian restaurant there happens to be in the not so little anymore Somerset village I grew up in, I offered to cook him a meal as I was lucky to be in England on the day. But not a red curry, a Thai green curry. 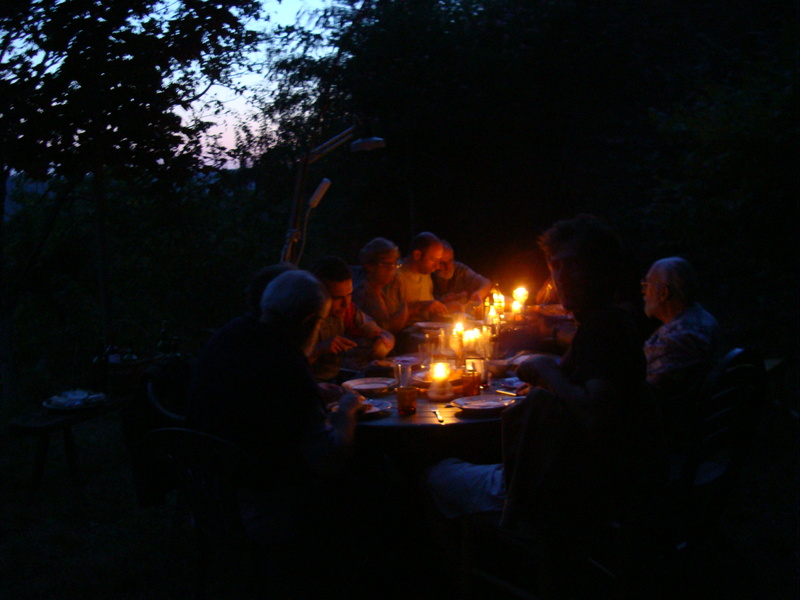 (And come to think of it, I also made it last summer for 14 of Pierre’s family, aunts, uncles, cousins, friends, son, mother…at the second home in Corrèze, which we ate by moonlight and candlelight). This is a great dish for making an impression when you have people around, and even with just some paste from the freezer and a tin of coconut milk and fish sauce from the storecupboard, you can use whatever you have in the fridge vegetable and protein wise. The trimmings make it all the more authentic. I’m lucky enough to be able to buy most ingredients fresh in an Asian grocery store about 5 minutes away from where I live in Paris. 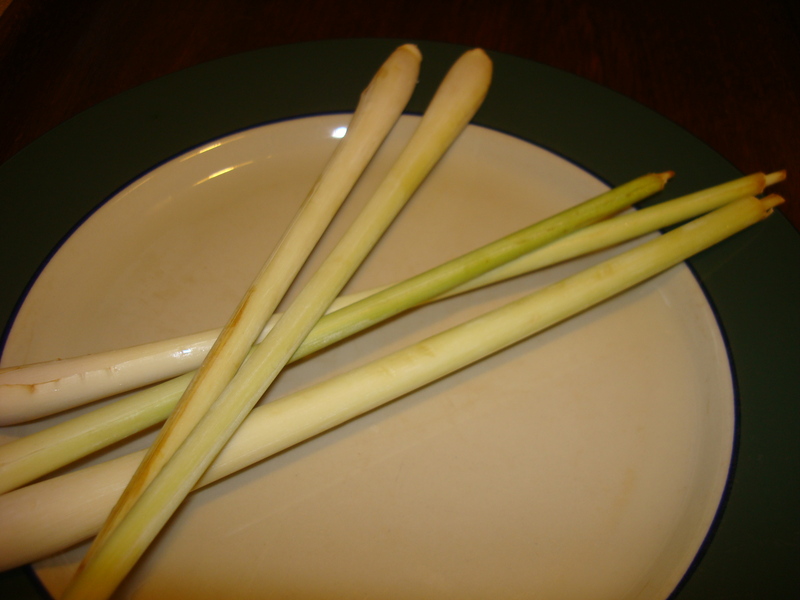 Therefore in addition to the green papaya I had stuffed into my suitcase on the way over, I also stuffed in a few stalks of lemongrass because I didn’t know if I’d only be able to get fresh (I have seen it). And some of the wonderfully fragrant knobbly kaffir limes, aka combawa, because I can get the real thing. Plus some knobby pieces of fresh galangal (Thai ginger). And some tiny white aubergines. Plus the more than pungent Asian shrimp paste (nothing to do with Shipham’s). A supermarket trip on arrival yielded the fish sauce, ground coriander and cumin, and a couple of tins of coconut milk and a green chili. (Back home I have a jar of preserved chilies as I’m wary of too much fire). So did my dad rate that there was enough sauce? Yes, with my brother commenting that it’s “vibrant with a lot going on”, compared to shop bought pastes, and even a restaurant Thai green curry. Should be a food critic. The great thing about this curry it is you basically whizz up the paste, throw it in a pan to cook, add the coconut milk, add the chicken and vegetables, let it simmer and it’s ready to serve. The other thing is you can make up at least two batches of curry paste and freeze one. I prefer to steam the chicken breasts first, then cut them up into bite size pieces. The chicken stays succulent and takes up the flavours. And if you can get kaffir lime leaves, use them more like a bay leaf, and take them out before serving. The ones I can get are frozen, and every time I’ve used them although they’re extremely fragrant I find even finely shredded they get stuck in your throat. 1. Whiz all the paste ingredients in an electric chopper or food processor. 2. Steam the chicken breast and cut it into bite-sized pieces. 3. Boil the water for the rice and cook it for the indicated time. 4. Fry the curry paste in a dry pan, and add the coconut milk. 7. Add the kaffir lime leaves, Thai basil and green peppercorns, if using. 8. Finish off with the fish sauce, lime juice, brown sugar. 9. Simmer for 5 minutes. 10. Remove the kaffir lime leaves if used. 11. Serve over the Thai rice, and scatter over some chopped fresh coriander and shredded red chili if you’re using it. This entry was posted in Main, Thai and tagged birthday, fish sauce, galangal, kaffir lime, lemongrass, shrimp paste, thai. Bookmark the permalink.